someone explain the new card market? Kid has 10 ABs in the bigs. This card isn't even rare, there are 150 of them. And it's a 9 not a 10. Last edited by Peter_Spaeth; 05-24-2018 at 05:06 PM. My guess is that prospectors are trying to hit on the next 1952 Mantle now. If they're right, that's a good investment. But my best guess is that 99.9% of all these limited, numbered, superfractored, etc. cards are going to be worth far less than what people are paying today. Sort of like my 1986 Donruss Jose Canseco. It's a lottery, nothing more, nothing less. It's not really a lottery though. Juan Soto has only experienced success at any level he's played at, so it's not like you're investing that in a guy who just got drafted. He's hot right now though so it's definitely not the time to buy but if you bought the corresponding Trout card for that price at the time I'm pretty sure you'd see a decent return. Last edited by packs; 05-24-2018 at 06:13 PM. Yes but he's 19, not like he has a meaningful record of success that says anything about how he is going to perform in MLB. Sure, it's POSSIBLE he becomes the next Trout, but realistically what are the chances, 1 in what? It seems a bad gamble to me. Last edited by Peter_Spaeth; 05-24-2018 at 06:17 PM. Well, I have to say this about him.....he's the first player in a looooong time, where you can actually read his autograph! Last edited by Steve D; 05-24-2018 at 07:55 PM. LOL I did notice that -- of course it's a short name so easy to sign. Yup, this is it. I’ve just recently ( about two years ago) tried to play. I’ve bought a few auto rookies mostly of a guy named Matt Chapman. He plays third base for the A’s. I like him and think he has potential. He just recently when in a slump but was hot at the start of the year. Is defense is outstanding. A few years back I bought a rookie of a kid named Cody Bellenger. I got his elite rookie for 3 bucks I sold it last year for 275 dollars. I felt like I won the lotto. No meaningful record but they're losing Harper and they have Soto and Victor Robles waiting in the wings. Hardly anyone sees meaningful playing time in the majors at 19 and Soto is expected to play every day for the rest of the year. He tore up pitching in the minors which is all you have to go on. Now is definitely not the time to buy. The time to buy would have been before the the season started. But everyone is worried about missing out on the next Trout card. Last edited by packs; 05-25-2018 at 08:42 AM. I also imagine that within a couple of months if not sooner he will have dozens of official RCs, not just the handful of minor league issues currently available. I'm hoping that's the case because I really don't like that Bowman card. In reality I really don't like most Bowman cards. I'm guessing that the Topps Heritage will be Soto's nicest rookie and that's the one I'll wait for. Those sets are always my favorite. For guys with their roots in vintage, Heritage is definitely the way to go. They have some interesting variations too if you're into that. Here's one I bought; and of course Correa has been in a major slump since I did. I also purchased an auto of him last year after seeing him have a heck of a game against a great pitcher. I believe he went 3 for 3 or 4 for 4 including a game winning homerun. 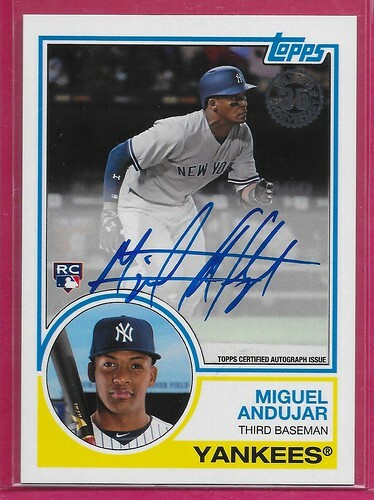 I liked what I seen and even though I don't normally purchase "modern" I thought, for the very affordable price, I'd purchase one of his cards for the heck of it. I haven't followed him at all this year but I think long term, he is going to be a great player? Anyone can turn into a pumpkin tomorrow. Even guys that have had success at the major league level. A bad injury can kill the career of someone that otherwise had multiple All-Star seasons. If all you care about is flipping a card I can't imagine you have much fun in the hobby. But I think for a lot of people getting in early on a player who has shown serious potential also brings fanfare. Just about everyone under 35 plays fantasy baseball and are used to rooting for players not on their favorite team because of it. It's an entirely different landscape than all the previous generations. So if someone hits a big Ozzie Albies rookie and becomes a fan of his I think that's cool in my book. As long as you're having fun and collecting within your means I say go for it. Last edited by HasselhoffsCheeseburger; 05-25-2018 at 10:53 AM. Last edited by packs; 05-25-2018 at 10:57 AM. Here's a Gleyber for ya. Yuck that card is horrible. The one I bought is so much nicer. From what I've seen the modern card market is all about gambling for a lot of collectors. Buying expensive cards hoping that a players performance will exceed the hype. And breaking boxes or cases hoping for the big pull. A few guys I know break cases right when they come out and immediately post most, if not all of the big cards on Ebay. But the big prospects' cards are way the hell up there as soon as they are released, and buying a lesser-hyped guy because you think he is going to fool everyone is a huge gamble. True but there are diamonds in the rough. Mookie Betts is a good example. He was pretty unheard of before he broke out as a rookie. The highest he was ranked on any Top 100 list was 62 and only once. No disagreement here. That's why I stay away from most modern issues. But the collectors who stocked up on guys like Trout, Kershaw, Lebron, Curry, etc probably did ok. But for every one of those there are 100s that become almost worthless. I used to follow Baseball America. Everyone sounds like a superstar. But very little of it means sh*t until we see if the guy can hit a major league curve ball, or if a pitcher can keep his control and composure under major league pressure. There is a video from 2010 on YouTube of a card shop owner opening a box of 2009 Bowman Chrome Draft for a customer. The guy pulls an orange Mike Trout auto card numbered to 25, I think. He says "I can't remember if this dude is good." Ha! If you read the video's comments, the customer sold the card for $450 and was thrilled about it. Fast-forward to now... The last one on ebay sold for a Best Offer (so you can't see the exact price) but it was over $55,000. Literally more expensive than any of his dads cards and his dad is in the HOF! I don't understand why these Bowman minor league cards are so expensive when the 80s and 90s minor league cards, also sometimes issued years before the ML rookie cards, sell for next to nothing. Example, you could probably pick up a Mint 1986 Palm Beach Randy Johnson, a top 10 or so all time pitcher, three years before his RCs, for under $100. And the pops are nothing compared to the Bowmans I would imagine. Last edited by Peter_Spaeth; 05-26-2018 at 09:50 AM. It really is crazy. The prospect first bowman cards go for insane prices and then it starts all over again five years later when their first RCs come out. I understand what you are saying, and you are correct. But not all the minor league cards from the 1980s are quite that cheap. I have a 1980 Reading Phillies AA card of Ryne Sandberg (his first card) because that is the local minor league team for me. I didn't think I had ever seen a Sandberg PSA Reading Phillies card sell for under $300 (at least not since I started following the card). When I looked at PSA's auction results listings, the cheapest Sandberg Reading Phillies card listed sold for $300. Last edited by Bored5000; 05-26-2018 at 10:53 AM. I don't get it either? Many HOF's cards sell for a lot less than some of these current prospects, but maybe it's a generational thing, who knows? I remember reading, from a member here, who posted up what he sold a 1 of 1 Nathan MacKinnon card for a fews years back and posted what it was currently selling for. That, in itself, was enough for me to steer clear! He sold it for $4500 U.S. and the current owner had it on E-Bay and the highest bid he received was $400. That was quite the loss if there was no reserve on it? Nathan Mackinnon had a great year this year so I assume most of his cards rebounded some but checking out the current lists on E-Bay, there are literally 100's and 100's of his cards! I guess to play this game, one needs a lot of expendable money. If you guys keep trying to relate different era of cards to each other you’ll never understand it. It’s a different beast, it’s more like a very volatile stock. It has nothing to do with the old performing stocks. It’s all about the here and now. Like I said last year I sold a Cody Bellinger for 275 after buying it for 3 dollars. Now that sell for half the price. It might never see that price again.if he has a chance any good year it might get close. I do pick up some low end rookies to speculate...went with Judge and Thames last year. Did great on Judge, should have known better with Thames...he's too old, but I saw him in spring training and his arms look like engine blocks. There are a lot of promising rookies over the last two years, but take if from a guy who owns an 800 lot of Tommy Gregg, it doesn't always work out. Yeah Mookie is a good example of that volatility. He has a good month and a half and some of his cards appear to have more than doubled. Day trading, I guess. Bowman is one of those legacy sets and Bowman Chrome/Topps Chrome in basketball are looked at as the most important cards for modern players. SP Authentic has the same weight in hockey. There will always be a premium for these sets. When Bowman Chrome came out in '97, Jose Cruz, Jr. was the biggest name in baseball prospecting. Did he pan out, not really-but people went absolutely crazy to see Chrome and Refractor versions of his cards. It never slowed down! The Bowman cards generally go for the most money because of their "First Card" status. Usually the Bowman Chrome or Bowman Draft set is the first appearance any player has in a card set as a "professional" which is why other minor league and Team USA cards are way cheaper even if they technically came out first. You can have Bryce Harper's Team USA autos for a significant discount over his Bowman rookie even though the USA cards were issued much earlier. Same goes for Kershaw, Scherzer, etc. I've seen a lot of hype in the past 40 years I've been collecting. Never saw the sense in chasing these cards, not my thing. I figure for every Mike Trout that you could score on, there are 100 Alex Rios'. Everyone in my generation was going to retire on Roger Clemens, Don Mattingly and Darryl Strawberry rookies, didn't work out so well. Most of these cards, especially graded cards where the guy didn't pan out, are less than worthless. Soto is an apparent stud. So was Joe Charboneau for that matter …. The modern card market is fast and furious. People made a boatload on Judge last year, and this year Torres could be the new guy. Want to make extra money on a Trout you are looking to sell? List it after a home run! When I was a kid in 1985 Dwight Gooden rookies jumped up to $15 or so. There were millions of copies from the three card manufactures and they still brought 30 times what a pack cost. Fast forward to today and the production totals are a fraction and while the demand is not as high for the product you get similar explosive results that are just wildly exaggerated per card because of scarcity. If you look at this from a purely financial perspective let's say you have 1 million copies of the 1985 Topps Dwight Gooden mentioned above. It has a market cap of $15 million. From a quick EBAY search it looks like there are roughly 1,000 Mike Trout Bowman Refractor's from the various copies in total. Lets assume a $15,000 average price. You once again have a $15 million dollar market cap. Yes, but there were maybe one or two other Gooden rookies. There are probably 500 other varieties of Trout rookies that were massively produced. The Update has a huge print run, but not the variations of the card. Some of those are extremely limited. Then you have the "boutique" issues like Sterling and Finest (to a lesser extent) where the run is limited on base and refractors are numbered. Comparing Trout RCs to some 80s RCs is a stretch imo …. The Update could easily go the way of the 89 UD Griffey, but I think this could very well be a $500 card in PSA 10 and perhaps even settle at that level. For the record, if it hits 500 I'm a seller lol! There are really only a few products that carry any value though: Bowman, Topps Heritage, Topps Pro Debut and Topps regular series cards. The Finest and Sterling, Panini, Donruss, etc. don't hold a ton of value. But Trout's Elite Extra cards do sell for a pretty decent price too. Last edited by packs; 05-31-2018 at 02:32 PM. In 1986 the Donruss Jose Canseco hit $100. Unheard of at the time for a pack pulled rookie. Donruss may have had a lower print run than Topps but there was plenty to go around. The card market has evolved during this time frame and with higher values paid for cards so some of it is simply buyers willing to part with larger sums to own cards. That said if you reduce the overall supply by 99.999999% like they have today for the best copies you get exponential increases in price. It isn't really that hard to understand. I agree personally that the speculation element can be a challenge to understand but once again with the supply being reduced so dramatically it doesn't really take that much interest to push prices up. If you follow the stock market you will see a small amount of volume move thinly traded stocks quite easily. This is why you get parabolic moves in modern cards all of the time. People like to speculate and they always have and with the internet making commerce so easy it just adds fuel to the fire. I have no interest but can understand why some do. The example earlier of buying a $3 card and selling it for $275 is like crack. Very easy to get addicted too. I went to high school with a guy that plays the modern game and it does produce winning results for many so I say if you have a high risk tolerance go for it. Last edited by Dpeck100; 05-31-2018 at 02:58 PM. Baseball players are so hit or miss (literally) even among the elite prospects that I would be very surprised if people can successfully speculate over a long period of time. Sure, you can hit it real big if you pick the right guy early enough, or get lucky on timing (buy a guy before he goes on a tear and his cards double). But over time, I am skeptical. This is by far the most difficult sport to predict success, just look at how many top Baseball America prospects never pan out. My own thought is that the best recipe for success would be to wait a couple of years to form a reasoned judgment that someone who has been solid but not spectacular has the tools to become a superstar. Although the cards of these players surely have moved up, there is probably still a fair amount of upside, and perhaps less downside given that they have demonstrated they can play at the major league level. For example, a guy like Jose Ramirez. But that said, I am not about to invest a lot of money in Jose any more than I am going to buy up Vlad Jr. or Juan Soto. Last edited by Peter_Spaeth; 05-31-2018 at 04:50 PM. It is impossible for every person who speculates on cards from any era to all win. I think your point is well taken and this guy is a baseball fanatic so his chances are immensely better than the person just playing momentum. He does research and really attempts to understand the players fundamentals on the field and lets that drive his speculative activity. Just like stocks you have to sell. So this means you will miss out on some monster gains and you must get comfortable with that. This is a major headwind for the participants chances of success as outliers can make it appear that ones ability to consistently be right is much better than it really is so if you get an outlier on the way down you can be toast. For the most part every hot card is better to be sold into the hype and fast thin markets push a few sales much further than can be sustained in a short window of time and in many cases permanently so most of the time you should take the money. Some of the moves have been simply incredible. Jeremy Lin was an obvious sell! Probably a ton of others could be named. Peter just for the record I have no valid opinion on the long term for Trout cards or Curry or whomever that is a current player. I just understand the reason the prices are so distorted compared to vintage or more sure fire items and it is simply because of on purpose scarcity to try and lead to this outcome. Here's a list I just found of 2007-2009 top 10 prospects obviously from people who know a lot, Baseball America. How would you have done betting on these fellas? It looks to me like more bust than boom but don't know. Last edited by Peter_Spaeth; 05-31-2018 at 05:50 PM. One thing to remember is that plenty flame out but there is massive upside volatility where someone wins and someone loses. Short term gyrations in tradable assets create opportunity. Plenty of that here. Sure, but there is also a very high risk is my only point. And my guess is that like the stock market, most people who speculate lose. Last edited by Peter_Spaeth; 05-31-2018 at 06:07 PM. I think you are right. That said not all strategies carry the same risk. When I have had good runs in trading options it was actually lots of singles and doubles that produced the results not home runs. When I have gotten killed it was going for home runs. I am sure this applies to modern day baseball card traders. I call them traders because that is what they are. People like you and I work on collections. Entirely different mindset.